Ideal Tax Solution, LLC has learned the number of criminal investigations has grown in addition to victim assistance efforts. The action follows successful implementation of a pilot program started in Florida last April. IRS, State Or Payroll Tax Problems? The IRS continues to aggressively work to identity theft issues on multiple fronts. Ideal Tax Solution, LLC is continuing to monitor the positive results of an identity theft law enforcement program which has seen the IRS prevent the issuance of more than $34 billion over the course of the past two years. In 2012, the IRS stopped 5 million suspicious returns in fiscal year 2012 – up from 3 million suspicious returns stopped in 2011. The expansion covers all fifty states and took effect Friday, March 29, 2013. Since October, there have been more than 670 criminal identity theft investigations opened. The sentences being handed down are averaging four years in custody with some perpetrators receiving as long as twenty years. Ideal Tax Solution works closely with the IRS to identify potential identity theft situations which could impact taxpayers. Since the start of 2013, the IRS has worked with victims to close more than 200,000 cases. This is in addition to the Identity Protection PIN (IP PIN) pilot, which assists victims with previously confirmed cases of identity theft. Ideal Tax Solution has installed a comprehensive protocol for its clients to help protect them from the growing criminal activity involving identity theft. Ideal Tax Solution has also learned that like the pilot program, state and local law enforcement officials with evidence of fraudulently filed federal tax returns will receive permission from the identity theft victim. The victim will complete an IRS disclosure form allowing the IRS to provide law enforcement with the fraudulently filed tax return. For detailed information on the expanded identity theft program contact Ideal Tax Solution of visit the IRS website at IRS.gov. 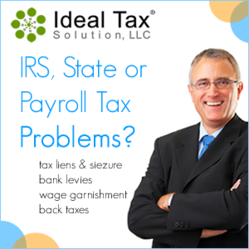 For U.S. taxpayers interested in finding out more about Ideal Tax Solution and their full range of in-depth and personalized tax preparation services, or for any tax help related issue, visit them online at http://www.idealtaxsolution.com. You can also reach them by phone by dialing 888.393.5154. Good tax tips and additional information can be found on their Facebook page and by following them on Twitter. About Ideal Tax Solution, LLC – Located in Costa Mesa, California, the company provides a full range of tax preparation and resolution services as well as reassurance to taxpayers nationwide. With more than 55 years of combined experience providing American taxpayers with federal and state income tax solutions, Ideal Tax Solution offers an experienced staff which includes Enrolled Agents, CPAs and Senior Tax Consultants who stand at the ready to help with any tax issues.